Internet giant Yahoo saw its third quarter profits more than treble - despite sales falling by about 12% - as it slashed costs. Yahoo said it earned $186m (£113.6m) compared with $54m in the same period last year. Revenue fell to $1.58bn. The firm has cut more than 2,000 jobs during the past year. But it is still struggling to lure back advertisers that trimmed their budgets during the recession, and spent money on emerging websites. Unlike rival Google, Yahoo has been struggling to turn its position as one of the world's most popular websites into profits. The company has tried to change its direction since chief executive Carol Bartz replaced co-founder Jerry Yang in January this year. Last month it relaunched its web portal, supported by a $100m global advertising campaign. Yahoo is also opening its home page to rivals, allowing users to integrate third-party web services like Facebook or Hotmail into its portal. "We knew the new management could drive some of the cost out of the system, but we want to start to see what can be done to have the company return to growth," said Olin Gillis, an analyst at Brigantine Advisors. "This is a company that's still very much in the process of being restructured. It's a mild positive. They're doing what they're supposed to be doing." In July, Microsoft and Yahoo agreed a deal that will see Yahoo's websites use both Microsoft's search technology and search advertising. 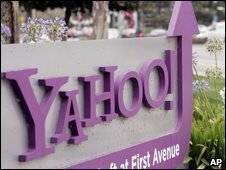 Yahoo in turn will become the sales team for banner advertising for both companies. However, the deal still awaits regulatory approval and is not expected to be finalised before spring 2010.